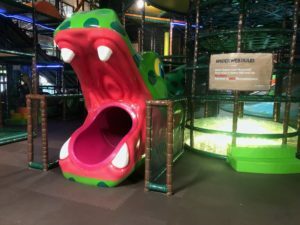 There’s a new indoor playground for kids in Edmonton to experience and it’s called Amazone Playzone. I’m always excited when a new indoor playground opens up in Edmonton especially when it’s so close to home. 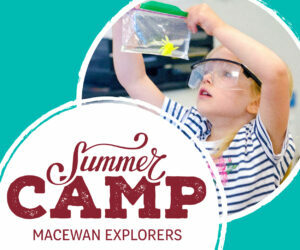 And it’s even better when it’s considered the largest indoor playground in Western Canada. 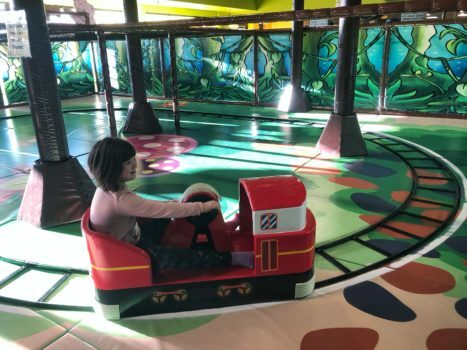 This indoor playground is a jungle theme and there are many fun little characteristics throughout that show this. The play structure is large and kids can spend a few hours easily exploring, climbing, sliding, and more throughout. Many of the areas are also accessible for adults so that if you have younger kids that still require an adult (or want a slight work out because some areas are like an easy version of American ninja warrior) you can go too! 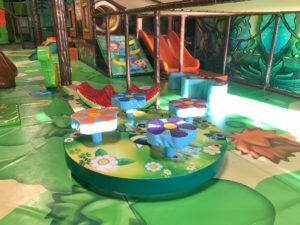 There is a dedicated toddler area which features a soft ground throughout and plenty of space to climb, slide, run and explore. This area is best suited for kids 3 and under and adult supervision is a must! The only thing that would make the toddler area better is a gate of some sort to block the toddler area, because well… sometimes they’re like mini escape artists. There is a small arcade area with games that you can play to collect tickets and other prizes which can be exchanged for prizes via their game zone counter. Finn was especially infatuated with this Paw Patrol Claw Machine game. 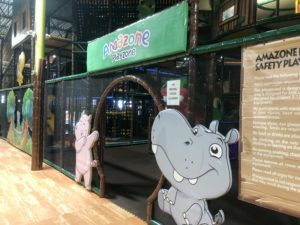 The thing about indoor playgrounds is that sometimes they can see redundant, however, Amazone Playzone has definitely stepped it up when it comes to unique things that aren’t at other places. This includes the large slide and the hand peddled train area. 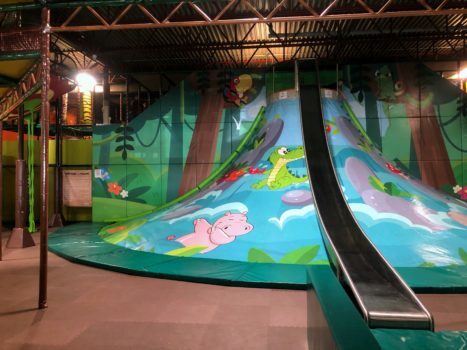 There is also a Sky Zone (zip line) that goes throughout the indoor playground as well as an Adventure Zone which is like the tv series wipeout out for kids! It features a trampoline with foam arms that you have to duck or jump over, a foam pit are and more. There is also a climbing wall area in the Adventure Zone which uses TruBlue Auto Belay to help make the climbing experience just that much more exciting. 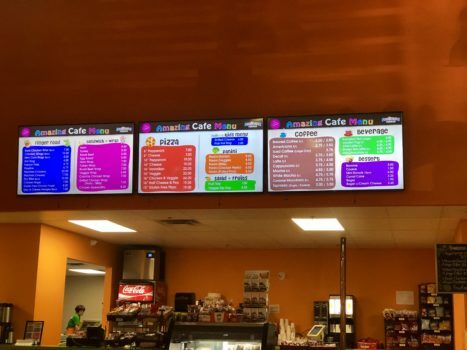 There’s a wide selection of food options to choose from in the cafeteria which includes finger foods, sandwiches, wraps, pizza, veggies, and fruit. For beverages, there are several different options which include a selection of coffee, tea, juice and more. Pricing for the menu options is affordable. There are several different combo options that are available. Kris and I both had the coffee and bagel combo which cost us around $7. Kids meals are also offered with choices of grilled cheese or hot dogs with a cookie and juice box for $5.25. All food is freshly prepared in the kitchen and was pretty good. You can find Amazone Playzone in Abbotsfield Mall where the Safeway use to be at 3210 118 Avenue NW. They are open daily from 9am-9pm. Admission prices vary depending on whether it’s a weekday or weekend. Everyone who is accessing Amazone Playzone is required to sign a waiver. We will defintely be back to check out Amazone Playzone again because it was a pretty good experience.